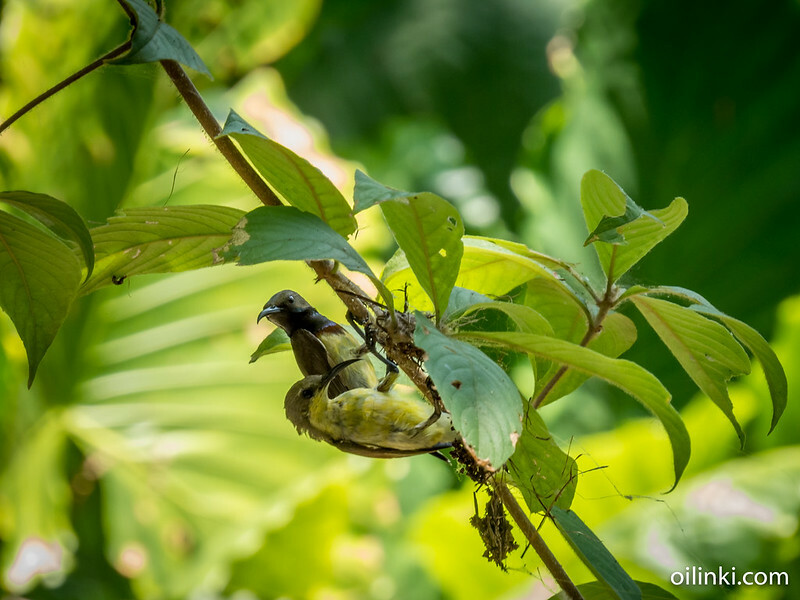 I had a lovely and very close opportunity to watch a Olive-backed sunbird couple while they were deciding their new nest location. 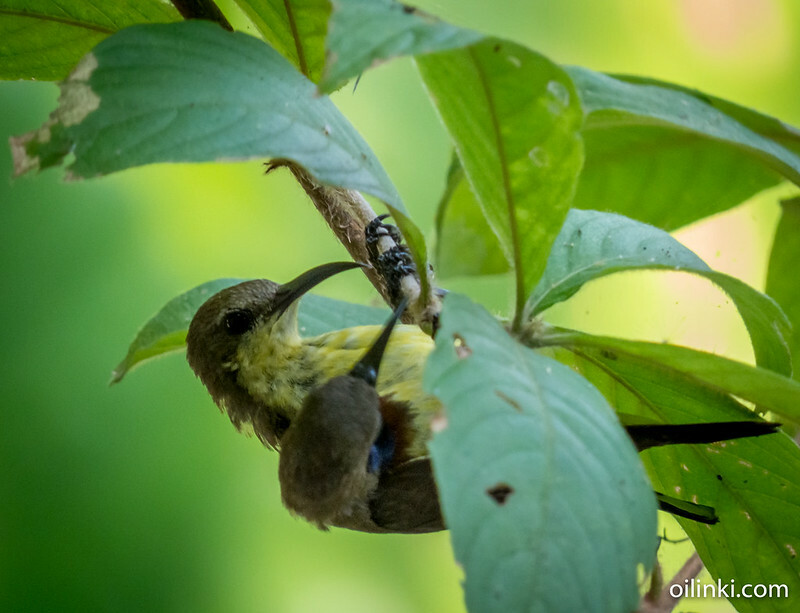 The olive backed sunbird, or sometimes called as 'Yellow-bellied sunbird' - Cinnyris jugularishad, couple were flying in front of my house for some time. They were doing short flights from one tree to another, and from branch to another, while looking for perfect location to build a nest. 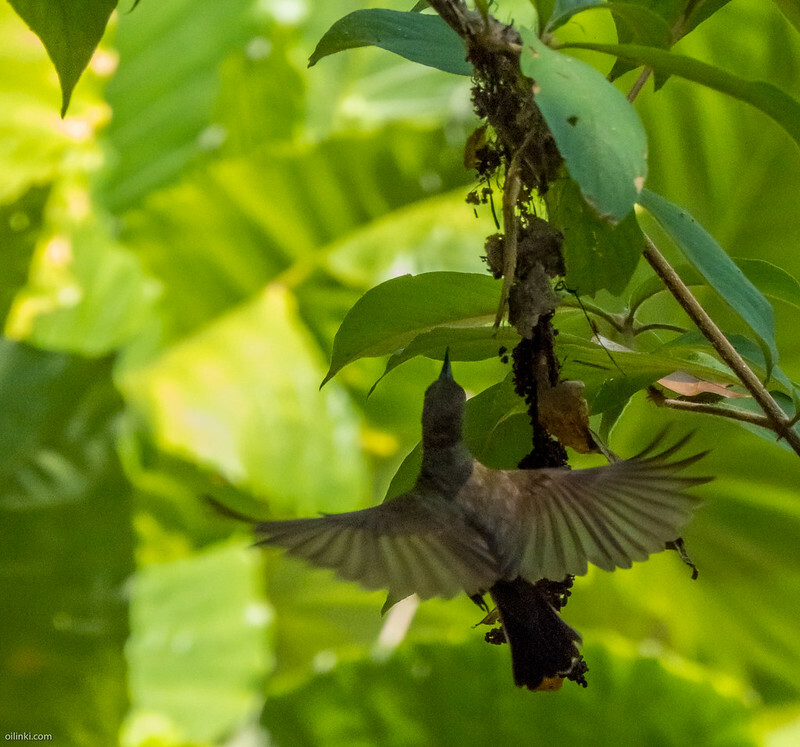 I was able to see and photograph, much to my surprise, how they decided together, where they would build their nest. The selected nest location was just 0.5 meters from my balcony. The very same, where I'm writing this blog.. and the very same, where my cat's like to sleep and watch the surrounding nature. This happened in February 2016. 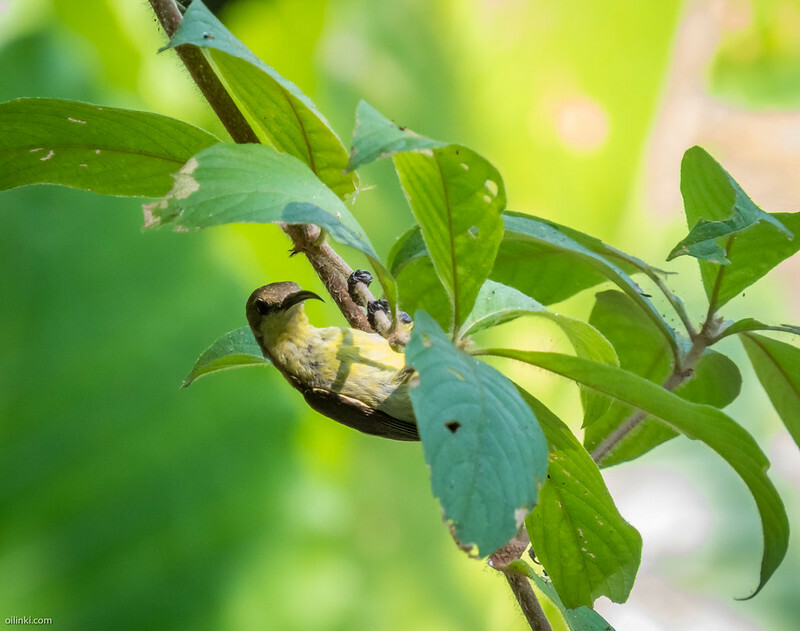 I'm writing this down as I can still remember the events and mainly because today I saw similar sunbird couple trying to find a place for their next nest. 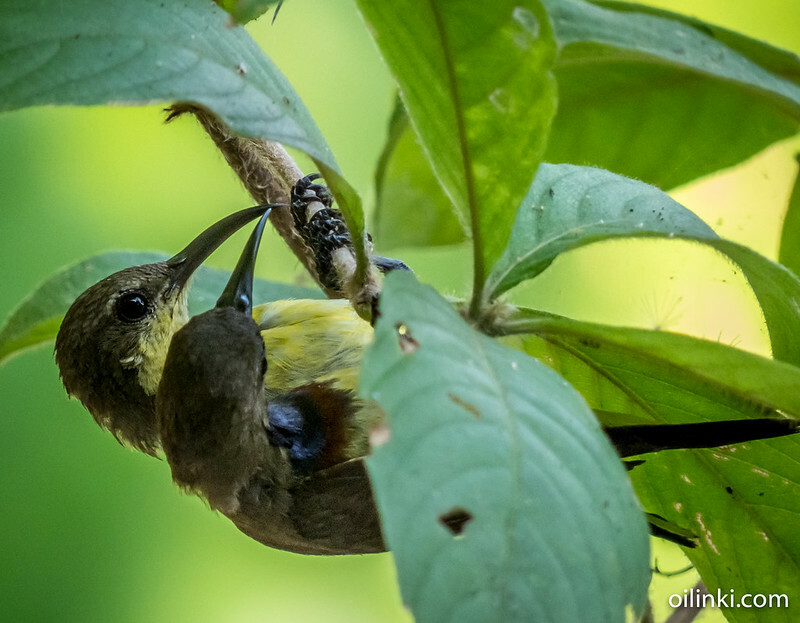 At the end of the story, the couple build their nest for some days, but stopped building every now and then. 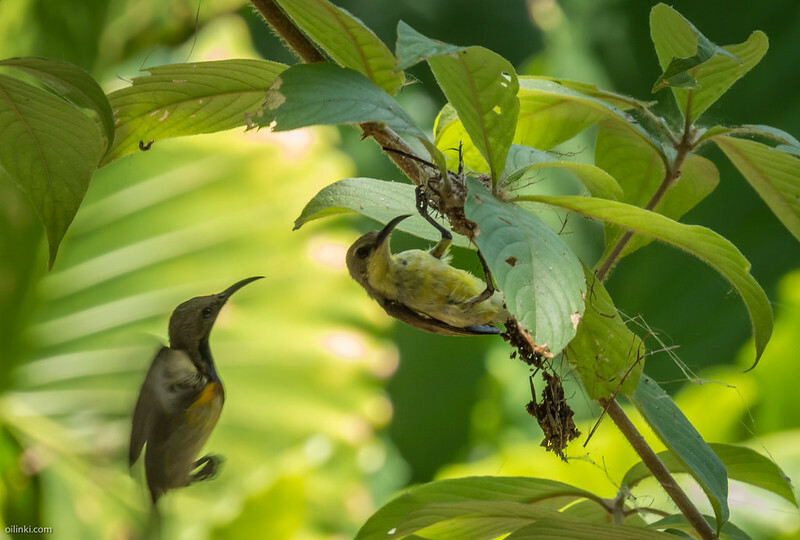 Eventually the sunbirds abandoned the pre-nest structure. Possibly because my cats were hanging just half an meter away from the nest. This could be a good spot to make a nest, what do you think? Yes my darling, I agree, you choose well. This is the spot! Unfortunately the nest was never completed. 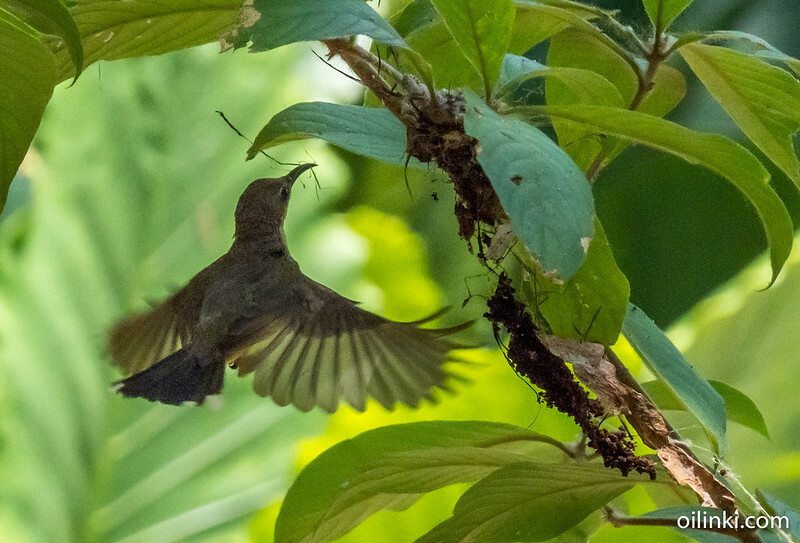 This is my last photo of nest making, before the couple decided to move on and build the nest somewhere else. At the time I had to travel aboard and couldn't see what was happening. I was hoping to see a ready nest when I came back, but that wish didn't fulfill. Nature have it's own ways. I wanted to know if this behavior of birds deciding together, where the nest should be build, has been documented and photographed. I have no contacts to local Thailand universities, so I contacted my own University of Turku, back in Finland. To my great surprise, in a matter of hours I was in contact with three different biology professors, one who was my childhood friend's father. Unfortunately they didn't have knowledge about the behavior of tropical birds.